There are some moments from the theatre that I’ll never forget because they are permanently imprinted on my psyche. “Let’s do the whole combination, facing away from the mirror… from the top… a five, six, seven, eight.” followed by an explosion of dancing to. The barricades unfolding and spinning around as the students prepare to make their final stand. Lot 666, a chandelier in pieces, rising from the stage as the overture plays. New to the list: Mortiz revealing to his father that he’s failing school and the argument that ensues, all played out in sign language as the words are projected on the back wall. The theatre’s completely silent, so quiet that you can hear that fabric of the father’s clothes moving as he gets more agitated. The father’s anguished cry is the only verbal sound in the scene. I’ve been a fan of Spring Awakening for some time. The music by Duncan Sheik and lyrics by Steve Sater has long been a staple of my iPod. I’ve seen the show twice–once on Broadway back in 2008 and more recently in Eureka in a community theatre production which was quite good. The Deaf West Theatre production, now on Broadway and running through mid-January, is one of the most extraordinary and powerful works I’ve ever seen on a stage. In this production, a number of the characters are deaf (and performed by deaf actors). Director Michael Arden and choreographer Spencer Lift have found ways to give this story of teens living in 1800s Germany more urgency than the original production. Some of this fresh take was provided in Arden’s director’s note in the Playbill as he explained that during this time in Europe and the U.S., sign language was banned in schools. Instead, Oralism (lip reading, speech and mimicking mouth shapes) was the preferred method of eduction. 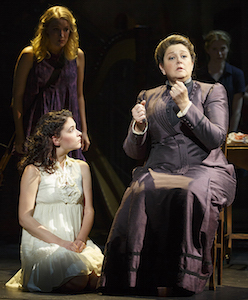 Deaf students who couldn’t master this were deemed a “failure,” just as Moritz is in the show. The inclusion of the sign language into the movement of the show is beautiful, from a single person signing to the entire company signing together. Care is taken to ensure everyone understand’s the entire show. If a scene is all sign, such as the argument, words are projected. Conversely, if a scene is all spoken, words are projected. Each deaf character, also has a voice–an actor who provides their singing or speaking voice. To me, it appeared as though the “voice” might well be the voice in the character’s head because of how the two actors interact with each other. In the picture to the right, you see Sandra Mae Frank as Wendla (in the white dress) while her “voice,” Kate Boeck, is behind her. Camryn Manheim, as Wendla’s mother, speaks for herself as she signs. As far as I could tell, nothing’s changed in the book or score for the show. The story continues to be about teens growing up, exploring their bodies and sexuality, testing their boundaries with authority and making mistakes along the way. The addition of the deaf teens, didn’t change the story but added another layer to it. The movement in the show is stunning. The choreography in “The Mirror-Blue Night,” where Melchior is alone in the hay loft was thrilling as the stage was darkened and everyone moved with lights at the tips of their fingers (you see a quick glimpse of this in the video below at about 30 seconds). I found the end of the show packed a much higher emotional punch than the original as well. Without giving anything away, as “The Song of Purple Summer” ends, I was shattered by the final image left on the stage. Each of the actors is superb. It was great to see Camryn Manheim and Marlee Matlin on stage. Andy Mientus (who I loved as Marius in the current revival of Les Miz is great as Hanschen. Krysta Rodriguez was heartbreaking as Ilse. 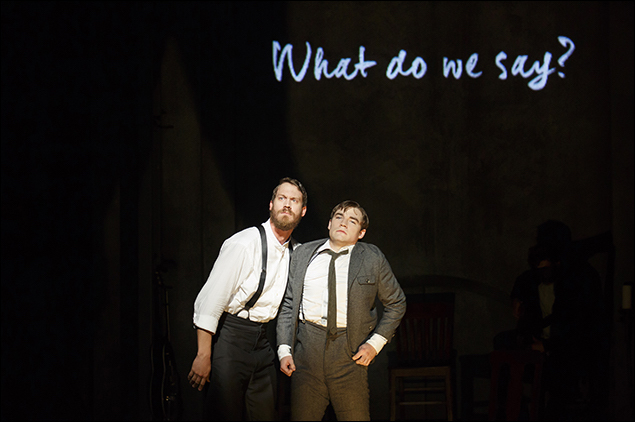 Patrick Page and Russell Harvard, splitting the adult men were on point, especially Harvard in the argument scene. Austin P. McKenzie, in his Broadway debut, was the emotional core of the show as Melchior and he was perfection. 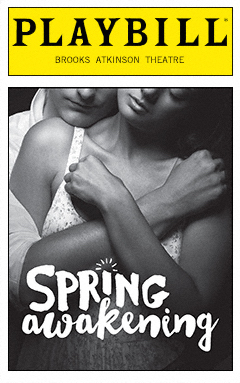 Spring Awakening is set to run through mid-January (and I don’t think it can extend since the Brooks Atkinson is scheduled to bring in Waitress in March). I highly recommend this production and only wish I could get back to NYC to see it again before it’s gone.